Today Dave explains why authors need to understand search engine optimization (SEO), why you need to use it to promote your books, and most importantly — how to use it! Search Engine Optimization, commonly referred to as SEO, is the art and science of convincing a search engine, like Google, to send people to your website, content, or product. As an author, why should you care? As you can see below, SEO has been critical part of the epic growth of my website, Kindlepreneur.com. Over 120,000 new people find my website every month. While I don’t blog about my books or use my email to push my book sales, many authors do and they enjoy the benefits of having new customers show up to their website every day. To illustrate the power of SEO for author websites, let’s consider the example of author Jody Hedlund. Wow! Anyone searching for those topics is exposed to Jody’s website and work. To receive that level of attention through paid advertising would be very costly indeed. Through author SEO, it can be yours for free. Is that thousands, and thousands? No, but that is new readers every day…even while she sleeps. Derek Murphy, the creator The YA Shelf, creates articles that his target readers would like like his article on best time travel books for teens. With this, he gets over 200 new visitors per day, and 500 new email signups a month. So, whether you’re nonfiction, or fiction, if you have a blog, and you’re not doing some SEO, then you’re missing out. Luckily, in today’s post, we’ll take care of that by looking at ways you can apply SEO to your author platform so as to attract more traffic. In the next instalment, we’ll look at applying SEO directly to your books, because don’t forget, but Amazon is also a search engine just like Google. We’ll now explore each stage in turn. Have you ever had an idea for an article, but held back from writing it due to the fear that it would receive no attention at all? Even worse, have you ever poured your heart and soul into a blog post, or even a book, only for it to fall flat on its face? Researching content using keyword research is a way of ensuring you write about the topics people are actively searching for in the most comprehensive and useful way possible. There are different levels of keyword research you can consider using, depending on your budget and scope of ambition. You can use Google to carry out basic, free keyword research. Say you have a blog on design and illustration, and you want to produce a ‘how to’ post. By typing ‘how to draw’ into the Google search bar, you receive a list of suggestions, as seen in the image below. These are the most popular variations of ‘how to draw’ searches people are carrying out on Google. By choosing any of these topics, you can create content safe in the demand that people are actively looking for it. The research process can also help open your mind to creative possibilities you hadn’t quite thought of. If you choose one of the suggestions from the above image, such as how to draw a rose, you will see further Google suggestions, as in the below image. You can then either group the suggestions into a single post, or create a more focused, thorough piece of content with the aim of focusing on a single, specific search phrase. Using a free tool, such as KWFinder, you can get a more detailed level of information on the keyword you are researching, as seen in the below image. This information allows you to focus your content creation on keywords that higher numbers of people are searching for, and which are realistic to rank for. Many authors will find free tools are enough for their needs. However, if you find the level of research you want to carry out is limited by free tools, or that keyword research is proving so effective you want to take it to the next level, a range of powerful, premium options exist. Semrush – A powerful option for keyword and competitor research with an intuitive interface. Longtail Pro – Keyword research software originally developed by Spencer Haws, a true guru of niche website creation that anyone can understand. Ahrefs – A powerful but complex option favored by many SEO specialists. So what else can you do with keywords, other than ensuring your topics are in-demand online? If you’ve taken the time to carry out keyword research for your author platform, consider applying it in the following ways. Keywords can help you ensure your content is aligned with the needs of people searching online. More so, the keyword also needs to be aligned with what kind of traffic or shopper you are looking for. 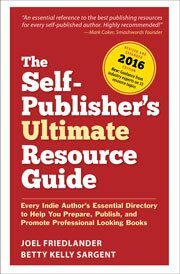 For example, Chandler Bolt of Self-publishing School, sells a course on how to publish your book. Therefore, the right kind of traffic for him is those that type in keywords into Google that are looking to start the process of getting their first book out there. Something like “how to write a book” or “how to start a book” is the right kind of search phrase for his potential shoppers, and of course is well captured by his article on that very topic. The writer behind Top Sci Fi Books did the same in that they targeted terms like Best Post Apocolytic books. If someone goes to Google, and types in “best [enter type of book here] books” that usually means they know what they want, and they are looking for their next book – wouldn’t it be great if your book was listed in there? The header tags on your blog are an ideal place to use keywords. Google uses your headers as an indication of your content’s focus. For example, if you had the phrase ‘book cover design’ in standard sized text somewhere in a post, it emphasizes the relevance of the phrase to Google less than if the same phrase was contained in a Header tag. By including the phrase ‘elements of the book spine’ in the header, the article is able to attract a broader range of traffic. When inserting an image into your author blog post, Google sees the ‘alt’ tag that the image has been given. Be sure to add a relevant keyword to each ‘alt’ tag to avoid missing this opportunity. Help your post meet Google’s technical requirements for title format, snippet preview, etc. The below image is a look at Yoast in action, taken from one of my posts on the different book writing software out there. By following the above ideas, you ensure your content is not only demanded by Google searchers, but that it is as easy for them to find as possible. So far, we’ve looked at how keyword research can ensure you provide the most useful content possible, and how you can optimize your author platform to make it discoverable. The final stage in understanding SEO related to your author platform is what to do after hitting publish. We’ll now cover two SEO friendly ways to promote your optimized author content. Promoting your content on social media is important as long as it’s done in a non-spammy way. There’s a debate as to the extent that social signals impact ranking, but they’re generally seen as positive. *The above tactics are wonderful when done right, but when done without taste, or legitimacy, it can be spammy. So, make sure you do these in a way that makes the internet a better place. Using these legitimate* link building approaches will help your content reach more people on Google and receive traffic well after publication. Next time, I’ll look at how to apply SEO concepts to your books in order to gain more readers and experience higher sales, because, believe it or not, Amazon is a search engine just like Google – but with a lit bit of difference. Hey Dave -that’s a really in-depth resource SEO resource for authors. In fact, very few SEO guides cover search intent in a meaningful way, so kudos for doing that. The reality of self-publishing is that you need to be at least 50% marketer, because the game is changing and anyone who doesn’t adapt is going to find themselves left behind. I can attest to the power of SEO. I have utilized many of Dave’s tips above and they work. A solid 3-5 sign ups per day – thanks Dave! Hey, Dave: aren’t you a sweetheart to share! I am a tad over 50 so I’m a borderline klutz who appreciates your kindness. Hi Eleanor! Thanks and absolutely. Thanks for the tips, Dave. As a fantasy author (who has moved away from blogging) I am curious how I can implement SEO for my platform without blogging. Maybe you’ll delve into this in the next part. Any info would be appreciated as I’m in the process of redesigning/building my current website & brand. Thanks! Hi JE, thanks. With regards to Search Engine Optimization, we have to have content that an engine can decipher is the content people are looking for, in order to be found. So, without written words from a post/article, it will be extremely hard to convince an algorithm that a particular page/website should be seen in the results for a particular search. Granted a home page can have content, but the chances of your home page being able to have enough content on it to create competitiveness for a keyword (other than branded keywords like your website’s name, or yours) will be EXTREMELY slim. There are things like Google Adwords, where you basically pay Google to put your website at the top of a ranking, however, that is a whole different beast and requires some highly optimized way to capture that paid traffic into something profitable. The SEO tips provided are excellent and make sense for nonfiction (which is my specialty), but offer little help for fiction (which dominates submissions in Joel’s cover contest and may reflect the majority interest in Joel’s blog). I think that’s fine, because I don’t see much reason for a novelist or poet to bother with SEO. If a potential reader seeks info based on a title or author’s name, SEO is not needed. If an author specializes in a crowded genre such as post-apocalyptical teenage romance, there is so much competition that no amount of SEO will help. I have multiple criticisms for Jody’s featured website. (1) It falls into the trap of many novelists by trying to provide advice for other writers. I’m a writer and have zero interest in the chicklit she writes. I might use her advice but would never buy her books. (2) As a secular Jew, I am turned off by the multiple references to Jesus. (3) Like Jody, I love golden retrievers (my 15-year-old died last year), but I couldn’t care less about the pets or children of any other author. Her menagerie, kids’ ages and favorite ice cream are not reasons to buy books, and the purpose of an author’s website is to motivate people to buy books. (5) Jody says, “I love genres of all kinds, both for reading and writing!” That is simply not believable. Does she write about repairing bicycles or read about piloting catamarans? (6) Encouraging people to “Come say hi. Don’t be shy!” is juvenile. Oh, sorry you felt that way about her site. It wasn’t supposed to be full analysis of her business model, but just the fact that a couple of pieces (using a little SEO) comprised of the majority of her writing. Thus highlighting how a little SEO and focus can go a long way. As to your first point about fiction and nonfiction, that’s why I included Derek Murphy’s The YA Shelf article “best time travel books for teens” which is solely focused on Fiction and gave a specific example of where fiction writers created articles that broght traffic. Another one I saw recently was a horror writer who wrote a post about the Top 20 Famous literary vampires (Can’t remember specifically the title but that was teh gist). It too contributed to about 60% of her total traffic, and at the end she talked about her vampire.